For the past two years I have crocheted on my own and hung hearts and a scarf on a lamppost outside what used to be The Forum in honor of Marc Fucarile, a member of my extended family who lost a leg in the second bombing. Marc is frequently quoted in the media saying how amazed he is by how much good has come out of something so bad. 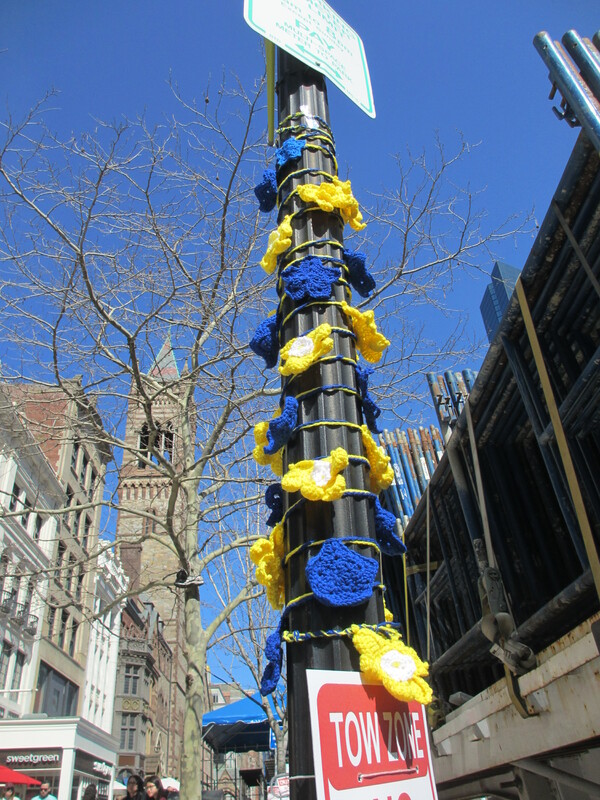 Until I worked on the Marathon Scarf Project organized by Old South Church (the “Church of the Finish Line” as it’s also known) I hadn’t seen that good first hand and it was amazing. These projects are my contribution to showing that love is greater than hate. After working on the Marathon Scarf Project I had been thinking that I wanted to make it a community project this year. Although I got a much later start than I’d intended, a group of very special Ravelers (people on the fiber arts focused social networking site, Ravelry) helped me make it happen. Last Saturday I received the last package of stars I needed (from Kansas!) to start assembling this year’s remembrance to mark the second anniversary of the Boston Marathon bombings. I worked past midnight to assemble two garlands of stars and daffodils. (It takes a surprisingly long time to chain together 30 stars and 30 daffodils!) The daffodils were inspired by the Massachusetts Horticultural Society’s Marathon Daffodils project which planted daffodils along the marathon route last year. The stars represent those we lost, those who survived, and the many first responders (professional and civilian) who saved so many lives that day. Since I had help this year I decided to make two garlands and install on both the lamppost outside what used to be The Forum and a lamppost outside Marathon Sports. On Sunday I went to Boylston Street to hang them. 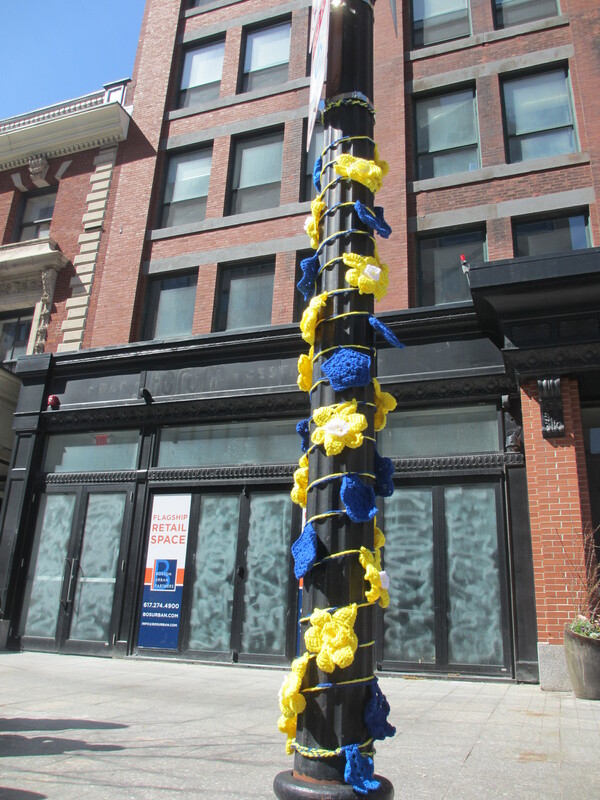 I woke up this morning to the surprise news that the city of Boston had allowed both garlands to remain on the lampposts for unveiling ceremonies for the commemorative banners marking today’s anniversary. We are honored that our crocheted remembrance was part of the ceremonies. and Francis Joseph Flaherty, a homeless gentleman who assisted me in putting up the garland outside Marathon Sports. Due to an emergency no parking sign at the bottom of the pole I had difficulty getting the garland arranged (I’m short) until Francis returned to his spot and offered to help. Francis said he’s out there every day so if you see him, please say thank you.